At this time the video clip is dedicated to the well-known watch company Corum, which is one of the major figures in the Swiss watch industry. 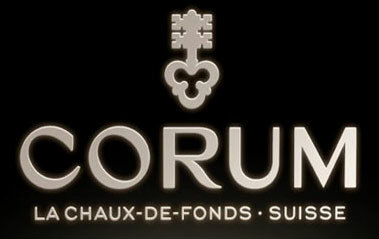 The watch company Corum was founded in 1955 by watchmaker Gaston Ries and his nephew René Bannwart in La Chaux-de-Fonds. As its symbol, the company chose the key that symbolizes access to the hearts of connoisseurs of Haute Horlogerie. The selected symbol played its role: today, Corum watches adorn the wrists of the true watch fans. At the annual exhibition BaselWorld 2012 the company Corum introduced its luxury novelties Corum 2012. The whole atmosphere of the room where the presentation was carried out as if prepared you that will be shown standing time and attention spent on visit to this presentation. Seeing firsthand Corum watches, and even turning them in hand, of course, you want to put them on the wrist and will never take them off. Let's see them closer. So, first presented novelty began a watch Corum Admiral's Cup Legend 42 Tourbillon Micro-Rotor. Even by the name can be understood that the main advantage of this model has become micro rotor and, of course, tourbillion. Watch case is made in a recognizable 12 - sided shape and it has become a kind of tribute to the legendary Admiral's Cup, which became the company’s face and the founder of an entire collection, which includes different and luxurious models. Corum Admiral's Cup Legend 42 Tourbillon Micro-Rotor watch is an elegant, classic and luxurious measuring of time, which is available in three versions: with case of 18-carat red gold, with a steel case and with a steel case which bezel is made of red 18 - carat of gold. Next presented novelty was Admiral's Cup Legend 42 Annual Calendar watch, the main feature of which in addition to recognizable and luxurious design has become an annual calendar, the existence of which is already in the model name. On the dial with vertical guilloche is located an additional hand that indexes the current date, and a small dial at position "6 o’clock", which indicates the current month. Buy Admiral's Cup Legend 42 Annual Calendar watch you can at a retail price that is about 10,000 CHF. The third model, which found it place in novelties Corum in 2012, became a luxury model Chronograph Admiral's Cup Legend 42 Chrono, which can be described as sporty chic. The mechanism with power reserve of 42 hours is certified COSC, which guarantees high quality and maximum precision in all conditions. On the guilloche dial are located counters of chronograph functions, as well as the aperture of the current date. In total there were presented 11 versions of the new Admiral's Cup Legend 42 Chrono, dials of which are decorated with various guilloche. Next presented novelty of the company Corum has a model with minute repeater, which was awarded by the title of the world premiere by the company Corum. The main feature of the new Corum model became four hammers, which beat off time. The presence of four hammers was not a novelty in the watch industry, but four different sounds - it is quite another matter! The model Corum with repeater is presented with the case of titanium or red gold. The company also released a version in white gold, which is adorned with baguette-cut diamonds. Also was presented a new women's watch Corum, which has become an updated version of a female model, which the company released last year. Ladies watch Corum is presented with steel bracelet and steel case or with case made of red gold. In every line, every detail can be clearly seen mission of the watch – a watch for lovely ladies. Mother of pearl dial is decorated with diamonds, which take the role of hour indices. Also was presented ladies watch Corum Admiral's Cup Legend 38 Fiancée, which is also refined and elegant watch creation. Watch dial of Admiral's Cup Legend 38 Fiancée is made of Brazilian and Thai mother of pearl of pink, blue, white and gray colors. On the dial are located skeletonized hands made of stainless steel. Hour indexes are replaced by 10 diamonds with total weight 0.10 carats. 42 - hour power reserve is provided by an automatic mechanism CO 082. Straps made of satin. The next presented model again was women's watch Admiral's Cup Legend 38 Mystery Moon, on the dial of which is located an indicator of moon phase and aperture of current date. Watch dial is made of natural Indonesian pearl, which gives an extra touch of luxury to watch. This watch is equipped with an automatic movement SO384 with power reserve of 42 hours. Next was presented a sporty model with second time zone indicator as well as an indicator of the day and night. Also was presented one of the bestsellers of the company Corum - the well-known model Admiral's Cup Challenger 44 Chrono. Model Admiral's Cup Challenger 44 Chrono is equipped with mechanism that is certified by COSC, which guarantees that you have on your wrist is extremely accurate and high quality timepiece. Masters of the company retained the shape of the case, but at this time made it of rubber. However, the crown and the chronograph function buttons are made of titanium. Masters of the company also introduced new colors of rubber straps. Next presented model was split - chronograph in a rather interesting design, which can be clearly seen in the prepared video clip. This year the company Corum did not present new mechanisms, however, it demonstrated a new version of the watch bracelet. More clearly see the novelties Corum 2012 at BaselWorld 2012 is possible by clicking on the following link - http://montre24.com/video/218/. Definitely, they are worth to see! Official site of Corum watches.